Depending on what you like to photograph, the fastest digital SLR may not be right for you. You pay a premium for speed: the computer processor inside the camera has to work extra hard to maintain a frenetic shooting pace, and you'll pay more for this extra speed. If you take photos of predominanty static subjects — portraits and landscapes — then you have no need for the cameras listed below. However, if you are a die-hard adrenaline junkie, then the fastest digital SLR cameras will help you capture action at its peak. Before I talk too much more about the fastest digital SLR cameras, a disclaimer is in order. Since the Digital SLR Guide is geared toward the average consumer instead of the professional photographer, I am not listing any pro cameras. While professional digital SLRs are faster than their consumer counterparts, they are priced well outside the range of most non-pros ($3,000 USD or more for the camera body alone). Therefore, this discussion about the fastest digital SLR will focus only on models that are less than $2,000 USD. Think of FPS and Buffer like marbles being dropped into a funnel. When you start out, the funnel is empty, so you can drop marbles into it as fast as you can go. Let's say that you can drop marbles into the funnel at a rate of 5 marbles per second. This is equivalent to FPS. Since the marbles don't fall out of the funnel at the same speed you put them in, at some point the funnel is going to fill with marbles. The funnel is equivalent to the Buffer. Once the funnel/buffer fills up, you have to add marbles at a slower rate until the funnel clears itself out. 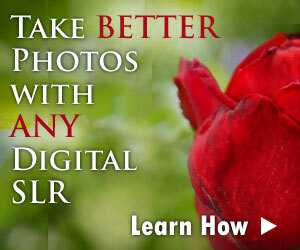 The fastest digital SLR isn't really an SLR in the strictest sense. SLR stands for "Single Lens Reflex" and it means that inside the camera there's a system of mirrors that reflect the image that passes through the lens up to an optical viewfinder. 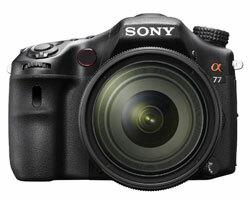 The fastest camera you can lay hands on right now is the Sony SLT-A77. The letters SLT stand for "Single Lens Translucent" and it's the translucent part that allows the Sony SLT-A77 to be as fast as it is. Inside the A77, a translucent mirror redirects some light to an electronic viewfinder, and the rest passes through the mirror to the camera's digital sensor. This system allows the Sony SLT-A77 to capture images at an astounding rate of 12 photos per second. When you add on the fact that the SLT-A77 can continuously autofocus as it's capturing consecutive photos, this makes it an attractive option for anyone who can leverage this type of speed.